Hessenwald School in Weiterstadt, Germany, is an example of energy-efficient, contemporary architecture that offers a new teaching and pedagogical model. At the centre of both model and building stands a well-lit and well-ventilated three-storey atrium. Everyone in the area is talking about Hessenwald School. The professionals, the local community, the pupils, the users and the teachers are all excited about the new school complex. The school has 700 pupils from surrounding towns and villages. Despite its size, Stuttgart-based architectural firm Wulf Architekten has succeeded in integrating the building with its surroundings (by means of a cluster-like pavilion design), whilst at the same time translating the open pedagogical concept into a clear and contemporary architectural language. At the centre is a well-lit and well-ventilated atrium that ties the whole complex together. The three-storey atrium links the assembly hall, break room, theatre and music room. Six VELUX Modular ‘Longlights’ provide optimal daylight conditions. The diffused, cool brightness that enters the building through the Longlights contrasts with the play of light from perforated sunscreens on the façade, creating a balanced atmosphere. This open architectural design supports an open approach to learning, with a variety of shared spaces that pupils can use independently. Hessenwald School brings together different levels of schooling, from high, through mid, to lower secondary levels, enabling pupils to switch levels depending on their performance. The whole school is designed to facilitate an open approach to learning; the centre and focal point for this approach is the atrium. 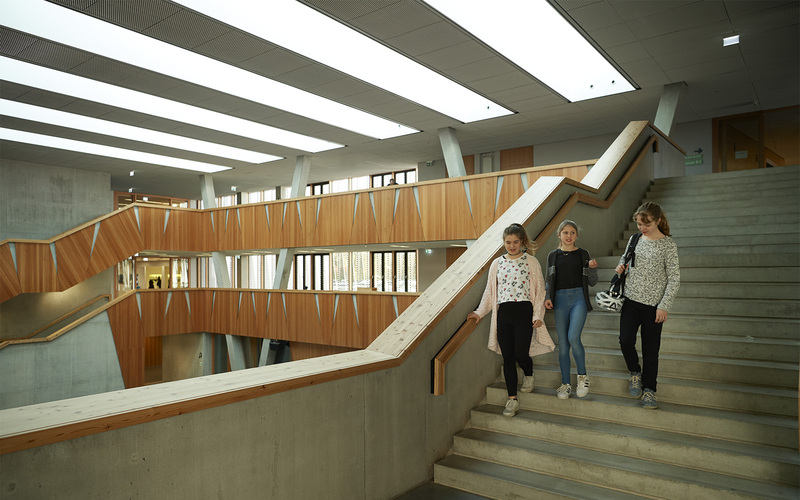 The atrium’s cuboid structure is clearly visible from the outside as an independent body, while inside it cuts through three storeys, connecting different learning spaces. The skylights are set back in light wells cut into the expanded metal ceiling, making them look almost like light fittings. However, the bright, natural daylight they provide turns them into a unique feature that gives the atrium its stunning appearance. The VELUX Modular ‘Longlights’ also support the building's energy concept. In winter, the large glazed areas in the roof contribute energy by warming the air inside the atrium, thus also helping to heat the different pavilions. In summer, warm air can escape through venting modules in the Longlights to keep temperatures down. The school was designed according to the guidelines for sustainable building in the district of Damburg-Dieburg. The solid construction’s clear-cut, low cubatures and good storage properties, ensure low maintenance costs through passive measures, while robust construction materials will mean minimal maintenance over time. The heating is provided by a biomass system in a separate building. 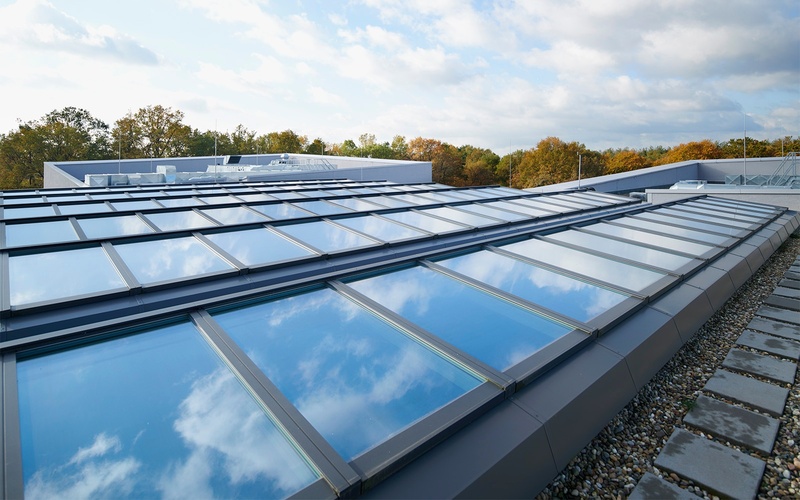 Overheating in the summer is prevented largely by the use of thermal mass in the exposed concrete ceilings, and by automated night-time cooling through the panels on the facade and VELUX Modular Skylights venting units in the atrium. This results in what the head of the school, Markus Bürger, describes as an "ideal indoor climate". "A climate in which one feels comfortable, shaped by the great architecture, the lighting conditions and the pleasant temperature. For the teachers and pupils to work well together the base - that is, the space - has to be right. What we're talking about here is not just an indoor climate, but a learning climate,” says Markus Bürger. In 2017 the school received a host of architectural awards, demonstrating that with the Hessenwald School, wulf architekten have succeeded in meeting the challenges of new, progressive approaches to teaching and learning with a modern architectural design.